Prairie makes a few barrel aged stouts. Last year we loved the Bomb!, their spicy coffee stout. They also have a very nice bourbon barrel aged oatmeal stout, Prairie Noir, that comes in 16.9 oz bottles. Prairie Apple Brandy Barrel Noir on the other hand, comes in 12 oz bottles and apparently does not come from the same base beer as that Noir, as there is no mention of oatmeal here. Released for the first time this year, we believe ABB Noir saw a more limited release than the larger format Prairie Noir. Our local could only sell us one bottle, and there appeared to be some trade demand. Often aged in a mix of old and new cognac barrels, made from Limousin oak, Apple brandy is a spirit distilled with apples as its sole ingredient. The French have long produced the best of the spirit, however newer American versions have recently appeared to compete as world class apple brandy. Pouring out viscous black, the carbonation shows itself in brown micro-bubbles that cling to the glass and linger a while. It smells potently of a sweet aperitif with maple syrup. The taste is a bold mix of vanilla and sugar, almost Coca-Cola with a slight hop kick in the finish, reflecting the 70 IBUs. The mouthfeel is oily, with the carbonation doing little, and a sweet, slightly burnt note in the finish. Not as thick as many modern American stouts. Unlike bourbon or rum barrel aged beers, I and likely most craft beer drinkers, are less familiar with the flavor profile of apple brandy. That said, I have tasted some better French Calvados, although I could likely not identify the specific barrel type used to age this beer. The brandy notes simply are not that distinctive to me. A spirit aged in cognac barrels, the barrels that aged apple brandy bring sweetness and vanilla in my experience, softening and refining a beer. Here, having not had the base beer, I am guessing those factors again came into play. Prairie Apple Brandy Barrel Noir is a sweet treat, however lacking a full body and the complex flavors of many other barrel aged stouts, keeps it from being a favorite. Best of Series: What is the Best Coffee Beer: Part 4? It seems each year more and more breweries decide to try their hand at pairing arabica beans with beer. Nearly always brewing a porter or stout, brewers blend the natural coffee/chocolate flavors of darker malts with bold roasts, often from their favorite local shops. The combination continues to prove popular with craft beer fans. For Part 4 in our series, we look at coffee beers from Avery, Hill Farmstead, Eclipse, and Jackie O’s. From barrel aged bombs to subtle milk stouts, we cover some of the best new coffee beers. Steve: I drank this from the bottle pictured above. Following the great success of Goose Island’s Bourbon County Brand Coffee Stout and Founders KBS, Avery takes the barrel aging process to their coffee stout. The 17.81% ABV stout is aged 4 months in bourbon barrels after brewing with an organic espresso blend from Ozo Coffee Co. Potent bourbon, coffee and chocolate notes on the nose. Pours black, with an unexpected ruddy brown head. The taste is a perhaps the most potent coffee flavored stout around. Huge espresso blends with the vanilla and char from bourbon barrels, and waves of sweetness to balance this explosive espresso shot. The booze kicks in in the finish as the mild carbonation holds on to make this dangerously drinkable: Amazing beer. Dave: … 5 oz pour in a large snifter at the new Avery tasting room in Boulder. Delivers on all the flavors promised and more – coffee, bourbon, oak, chocolate, molasses. Huge flavors blended well with no noticeable alcohol bite. Superlative. New space Avery is terrific – a must stop when in CO.
A big Russian imperial stout brewed with brown sugar, Dark Apparition from Jackie O’s may be the most recognizable label from the Athens Ohio brewery. Tasted here is a newly bottled variant, brewed with vanilla and coffee. While the original has bold malts with some coffee notes, this beer smells distinctly of vanilla and coffee, with mild soy sauce and hops less pronounced. The carbonation is good for a 10.5% ABVer, helping making the thick body quafable. Finish is fading vanilla with the coffee showing itself in a bitter note. Overall, the taste is very close to the base beer, with modest vanilla notes, and a hint of coffee. 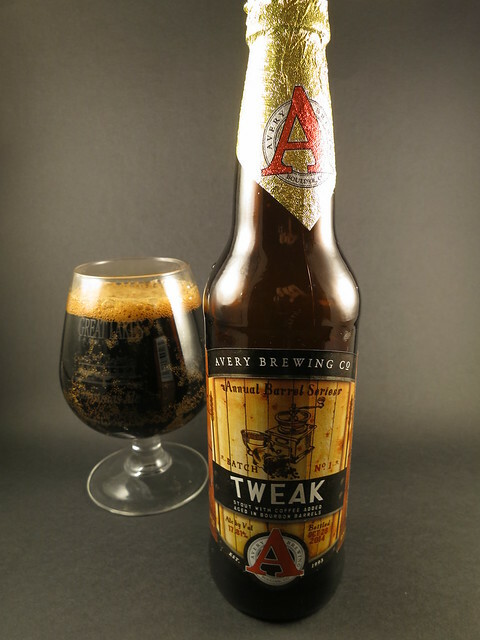 If you like vanilla, and maybe don’t even like coffee, this beer is a fun twist on Dark App. If you are looking for a coffee forward beer that brings the java up front, this one might be a slight let down. In the summer of 2014 Sierra Nevada released a 12-pack of collaboration bottles and cans, each a separate beer brewed in conjunction with “…coveted breweries, which were selected for their innovation and reputation for brewing world-class beers”. As you may recall, I visited Ninkasi and they certainly fit this description. So I was thrilled they were selected to team up on a coffee based milk stout. The Oregon brewer employed a cold pressed blend from the famous Stumptown Coffee Roasters to flavor Double Latte. 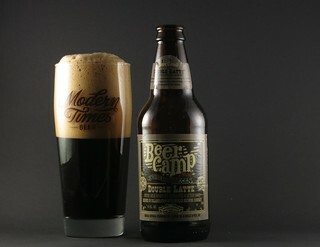 And to great effect, this Beer Camp bottle pours a chocolate malt looking head that is frothy and long lasting, smelling of coffee, chocolate, and fruit. No soy sauce notes are present in the sweet coffee flavors that match the nose. The body is a glorious silky, creamy mouthfeel. There is just a hint of sweetness, along with mild acidity and a hop presence, all balancing each other. Dry finish with some lingering coffee and hops. One of my favorite beers from the 2014 Beer Camp collection. Note: Unfortunately, this beer will not be scored due to its age. Bottled in December of 2012, we didn’t sample it until February of 2014. Just like ground coffee in a can, the volatile oils from roasted beans fall off quickly in beer. 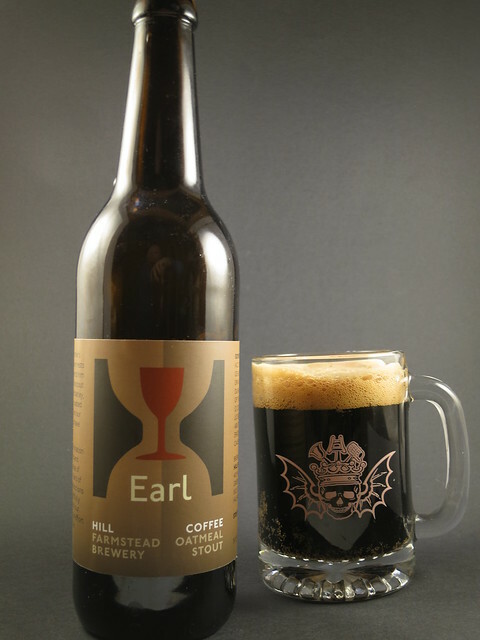 Aged or not, Earl opens with a crisp pop of the cap, pouring out a dense wet sand colored head with good retention. The aromas are sweet grains, and stone fruit. The flavors of this stout are roasted grain, oatmeal, semi-sweet chocolate, and fruit, with a hint of coffee building. The body is marvelous, with the oatmeal adding a creaminess to the thick stout. Finish on the palette is a transition to bitter coffee, that builds. A very nice beer, that is almost certainly even better with fresh coffee flavor. For some, there is no such thing as bad pizza. Thick or thin crust, allowing for some standards such as fresh ingredients, the basic components are a time honored infatuation for millions of pizza lovers. It seems that with coffee beer too, we have come to a place where highly skilled brewers using high quality coffee, are hard pressed to brew a bad coffee beer. While some may prefer the vanilla in one recipe over the bourbon in another, none of these coffee based beers left us unhappy.